Problem: Turning crude oil into gasoline involves a process known as catalytic cracking, which splits large hydrocarbon molecules into simpler fragments. Refineries traditionally use synthetic porous materials called zeolites as catalysts for these reactions. The standard zeolite has pores less than one nanometer across, so the largest hydrocarbon molecules can't fit inside them and undergo the reactions that break the bonds between atoms. Increasing the pore size of the zeolites would allow a larger fraction of crude oil to be converted into useful products. Companies have spent three decades and millions of dollars trying to increase pore size, without much success. Solution: Javier García-­Martínez, leader of the Molecular Nanotechnology Lab at the University of ­Alicante in Spain, has developed a way to increase pore size to between two and ten nanometers, the ideal range for producing gasoline. He mixes zeolites with an alkaline solution. A soaplike surfactant is added to the solution and forms small structures that the zeolites reconstruct themselves around. The surfactant is then burned off. 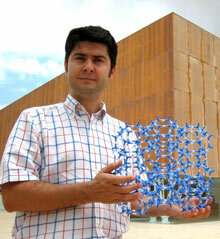 Choosing surfactants of different molecular sizes allows García-Martínez to tune the pore size, so he can optimize the zeolites for other purposes, such as chemical synthesis or water treatment. He cofounded a company, Rive Technology, that is now working to commercialize the technology and test it in a working refinery. Since I am good at mangling the spoken and written English language, I am usually quite tolerant of other's mangles. However, I find it disappointing that this MIT publication stooped to the use of the word gas for gasoline. Re. the link wording "Javier GarcÃ­a-MartÃ­nez, a member of the TR35, is developing better ways to make gas using new zeolites."